I've tried to find the answer to this on my own, but I'm struggling. I'm hoping the question will be easy for you to answer and interesting enough that you'd like to answer it. I teach products liability, so I've been interested in the Consumer Products Safety Commission's notice of intent to ban Buckyballs and other, similar magnet sets meant to be adult desk toys. 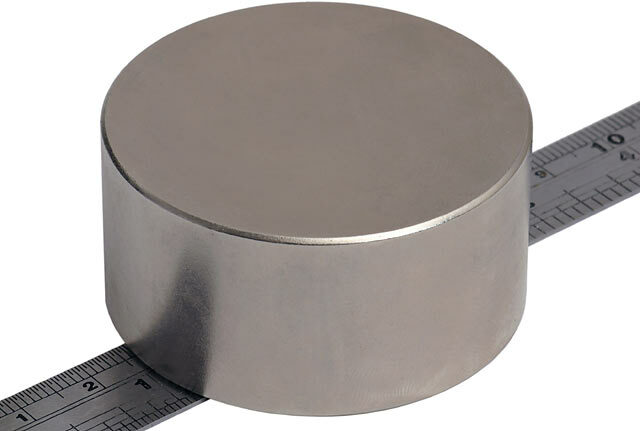 The CPSC would like to ban magnet sets that contain magnets that have a flux index of over 50 and are so small that they fit within the CPSC's small parts cylinder. Most of the magnets in these sets are 5mm in diameter, although some sets have smaller magnets. To be too big for the cylinder, the magnets would have to be more than 31.7mm in diameter. So, to have an intelligent conversation with my students about this product, I need to know what would be the effect on the utility of these magnet sets if the spherical magnets are made too large to fit in the cylinder. These are NIB magnets. 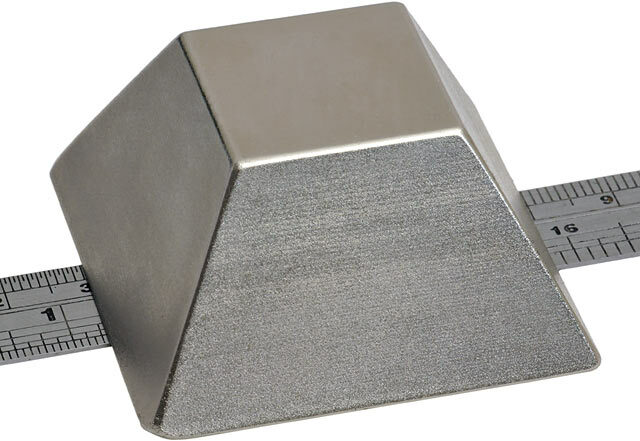 Would the magnet sets with larger magnets still work effectively as desk toys, or would their properties change in a way that would make them less effective? Or are they just less fun if they're that much bigger? Any thoughts you're willing to share would be greatly appreciated. And thanks for reading this far. Oh, man. That would be such a bad idea. So gloriously, horrifyingly, hilariously bad. But possibly rescuable with some serious design changes, on top of the larger size. On the plus side, making novelty-toy rare-earth magnets more than 30mm in diameter probably would reduce swallowing incidents to zero. On the minus side, the per-unit bulk price for rare-earth magnets that big is probably about $5, making a set of more than a few of them rather expensive. And on the second and rather larger minus side, such a toy would hunger implacably for your blood, bones and cartilage. As a general rule, large NIB magnets are Serious Business and Absolutely Not Toys. They can clamp onto ferromagnetic objects, and especially onto each other, with terrifying force. If all you lose is the end of your finger, you should count yourself lucky. ...like for instance finding and extracting the end of a broken felting needle from the enormous ball of shed cat fur which I am making because why not. When I have such an application for one of those magnets, I treat the damn thing like a 70-year-old hand grenade. I would not even consider any activity that required me to use two of them at once. And they're not even all that big. Sort your eBay search highest-price-first and, among the bulk-lot listings for large numbers of smaller magnets, you'll find some real nightmare fuel. Six-by-four-by-two blocks, for God's sake. Under the shiny coating, rare-earth and conventional ferrite magnets are also quite a fragile ceramic, so two large NIB magnets allowed to smash into each other can easily, essentially, explode. Spherical NIB magnets are a particular problem, because the contact patches between them are very small. Little 5mm sphere magnets work as toys because their attraction to each other isn't nearly strong enough to be dangerous, and the coating on the outside (usually silvery nickel) is thicker, proportionally speaking. (I think quality NIB spheres may have thicker-than-normal coatings, too.) But large NIB spheres - like, anything from about 10mm up - start to become a pretty serious pinch hazard, and will damage the coating at their contact points quite quickly. To get around all this for a toy with large magnetic spheres, you could make the spheres out of something non-magnetic, and embed smaller rare-earth magnets in there. Perhaps a 20mm magnet centred in a 35mm block of plastic, for instance, or multiple little magnets in a plastic block, or just a really, really thick epoxy coating. I don't know how well it would work, but at least it wouldn't actively desire your destruction. The popular shiny black ovoid "rattlesnake egg" magnets can safely be allowed to fly at each other and chatter together, because they're made from durable artificial hematite, and perhaps a bit stronger than ordinary ferrite magnets, but still not nearly as strong as commonplace neodymium-iron-boron magnets. Magnets of this sort might also be a good choice as "giant Buckyballs". I continue to strongly recommend that people buy a ton of little rare-earth magnets for pennies on eBay; they really are excellent toys, not to mention useful for all sorts of odd things from hanging up tools to clamping small items until the glue sets. They're just not for little kids, because little kids are idiots. To the original poster, inquiring about the change in fun factor - clearly, you've never actually played with the small ones:). If you are the type of (obsessive-compulsive, in all likelihood;) person who likes to make things go "click" when they're bored, pop wrapping bubbles, or turn a mechanical pen on and off click-click-click to the annoyance of all around, the little magnets are a god-send! None of this whatsoever would be possible with magnets 30mm of thickness even if, contrary to the very true issues Dan pointed out, somehow they were made with "equivalent magnetic attraction and other relative properties" (wave of hand). I am not new to dangerous things with extensive experience with Oxy-acetylene "bombs", Potato cannons (using mapp gas), several other various scar leaving contraptions, and thanks to you, sparkler bombs. I pulled both of them out of their package and got them sort of close. The force with what they instantly attracted to each other is difficult to explain, but let's just say I doubt that skin or bone would have much of a chance. I didn't get hurt at all, but I was lucky to keep all my fingers. Since that date they remain in the bottom of the tool chest (Still un-seperated). Every time I see a post about magnets I still get shivers. That's why you get the ones you can "turn off" by turning a handle :-). What the handle always does, I think, is turn a high-mechanical-advantage screw or cam that moves the actual magnet inside the housing away from the pole piece. The pole piece(s) makes the magnet strong in one direction but not very strong in any other. These days cheap salvage-fishing magnets probably have NIB magnets inside, making them even stronger than the old ones that were plain ferrite; a big ferrite magnet with a well-designed pole piece can be surprisingly powerful, though. A variety of wooden contraptions have been made to shear strong magnets apart from each other. But perhaps it's better to leave them locked together as, as you say, a caution. Or perhaps he who separates them will be king of all England. I dunno. Back already. Very unimpressive :( tried putting a pencil between them and it dented it. It left a little gap, and I was able to easily separate them by hand. When they snap together on their flat surfaces with nothing between they produce a loud snap, and sound dangerous, but that's about it. Bummer.